This winter, I have been avoiding any personal, fun purchases. You know, buying stuff -just because. This meant I haven’t been out gallivanting too much, so no road trips to any cute little places that might inspire me into spending money. I am still very much in this mindset, but yesterday, my friend was visiting and we drove down to Berneck, St. Gallen for a nice walk amongst the vineyards and surrounding mountains of the Rhein valley. 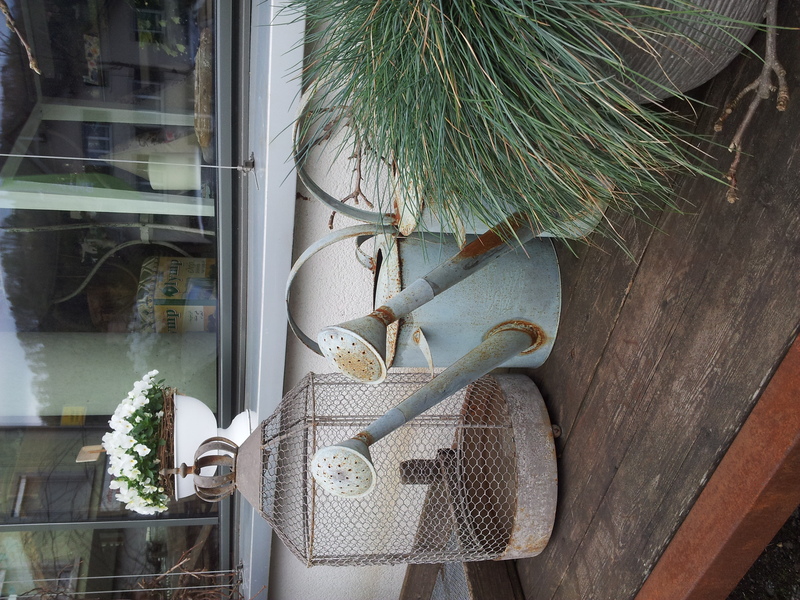 We weren’t planning to do any shopping, except maybe some very quick window shopping in Berneck. But on the way, we passed the town of Au, where I wanted to start our walk to Berneck. Now Au, is simply a border town, the gateway to Eastern Europe from my side of Switzerland, and the border to Austria’s Vorarlberg area. There are just homes and some businesses, nothing worth blinking at with regards to shopping, let alone, spending a lazy half hour or more. Or so I thought. 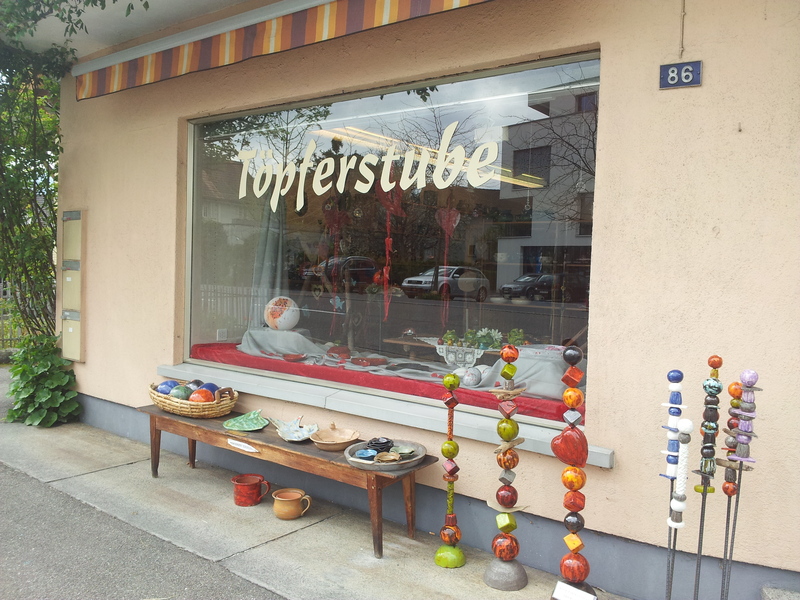 It started with this Potter’s, Töpferstube. It looked like it had some bright and colorful pieces, just like what I thought my friend might like. I have been wanting to try a pottery course for ages as I love collecting different pieces of ceramic and porcelain and want to make my own designs. So this seemed like a great place to pop into before starting our walk. Well we weren’t disappointed, the shop owner was very friendly and had some very pretty pieces on sale, as well as little decorations to hang which one could paint oneself. I was particularly taken by some utilitarian pieces, which were very traditional and yet something I had yet to see here in Switzerland, the perfect breakfast pieces, blue and white and chunky- sturdy. (I will send my husband back for my yearly mug gift.) Mrs. Müller also offered courses, which I may just check out. After we walked out of the store, we were greeted by the tantalizing view of yet another interesting looking store. 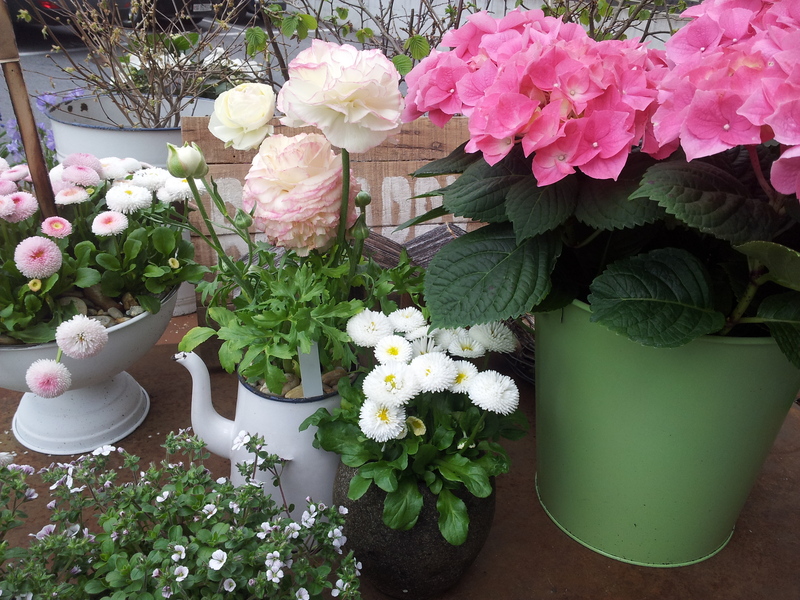 With all the flowers outside, I mistook it for a flower shop and thought it was a pretty safe bet that I could resist any temptations to buy. But I was wrong. Oh so wrong! 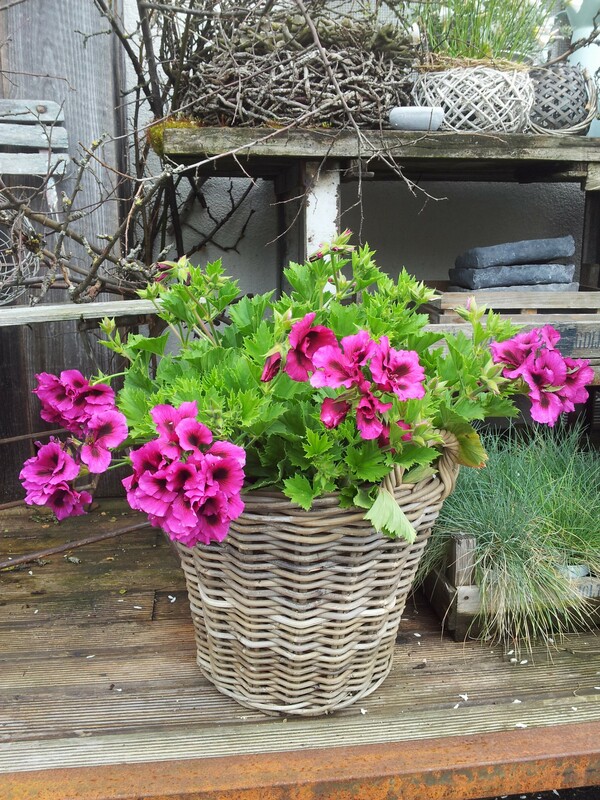 I fell in love with this fancy geranium, but nevertheless, resisted the temptation to purchase it. 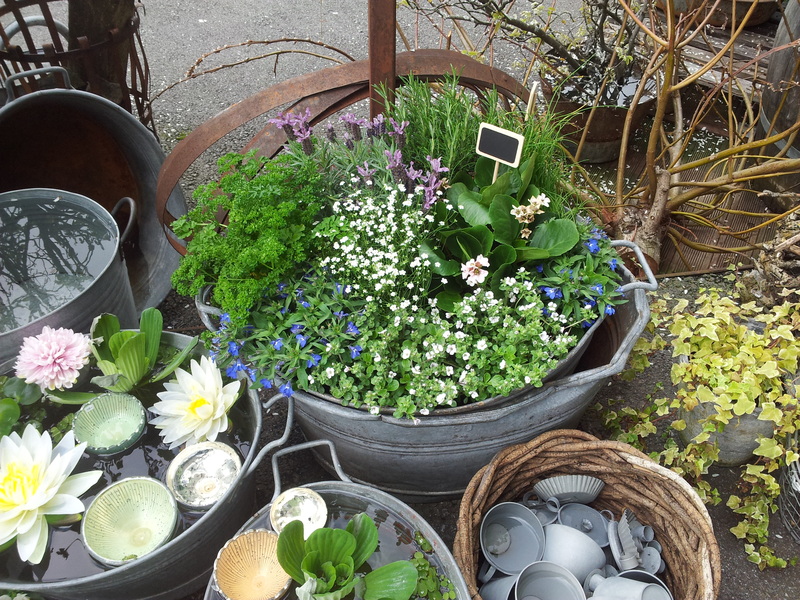 I thought the water idea, with real flowers, was a great idea for all those old zinc tubs I have in the garden. Though I guess the bottom would rust after a while. 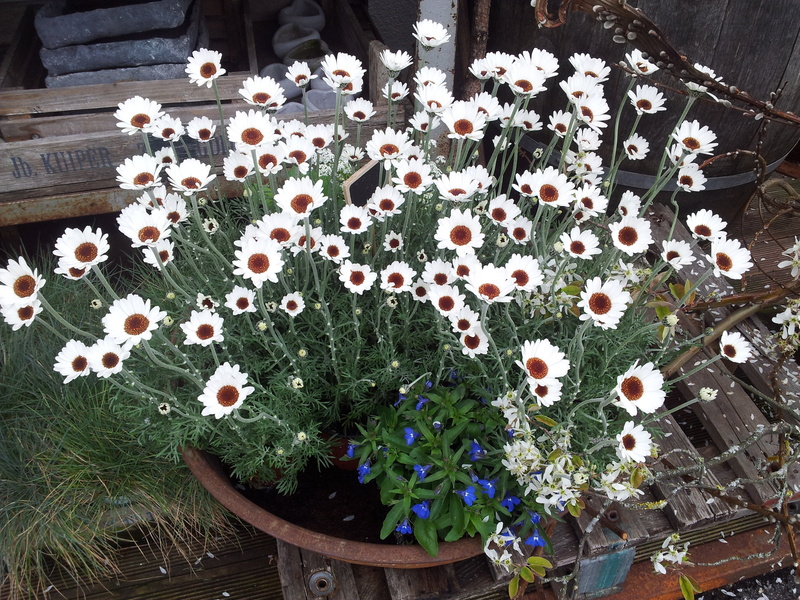 I love the herbs one, this is how I had mine, before it became an eyesore in my garden. Coming to this store was just an overload for my visual sensory organ and such inspiration. While outside was a treat, inside this little store , querbeet -Flor and Glor made me feel at home, and reminded me of all the things I love: like little boutiques, antiques and home decor items. 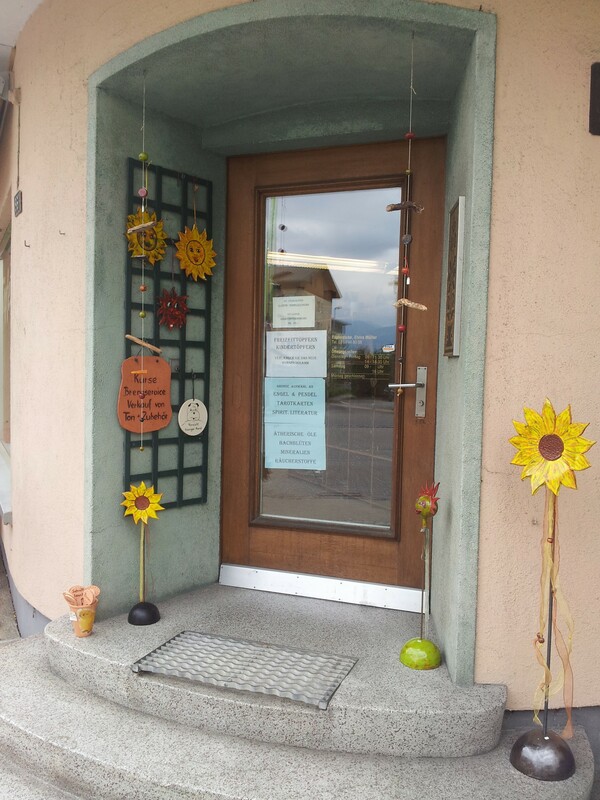 What was inside was not your typical Swiss florist. No, it was actually a boutique selling specialty gifts such as foodie gifts like fancy balsamic vinegar, and chutney and chili sauces from Stonewall Kitchen. I immediately felt transported to trendy big city like Boston or Seattle, where these quirky little shops abound. What I most loved of course was the upcycled furniture and picture frames, as well as some quirky antiques and big-stitch quilts. What made it even better was that my friend was almost as excited as me, and she lives in Zurich, and so has access to cute little shops like this one. Well I will definitely be going back to this little treasure in Au. 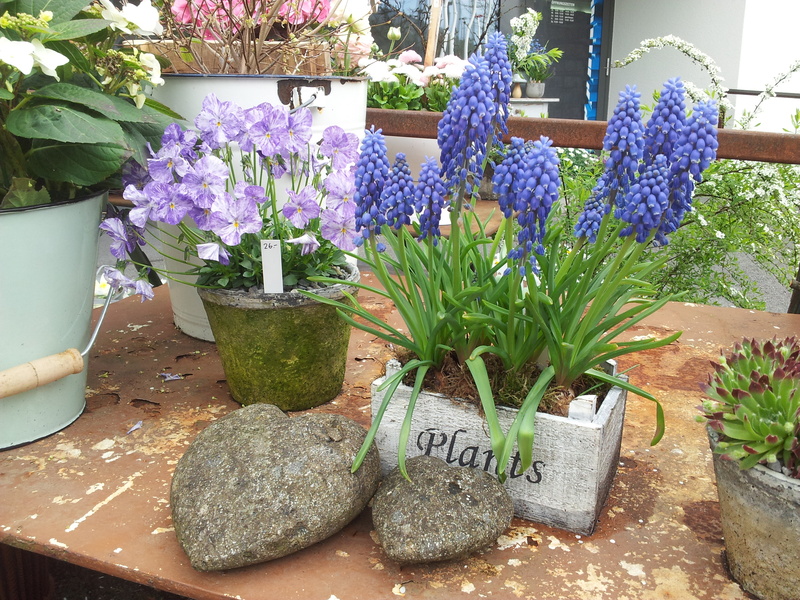 For details on this shop, querbeet -Flor and Glor , visit their website here. 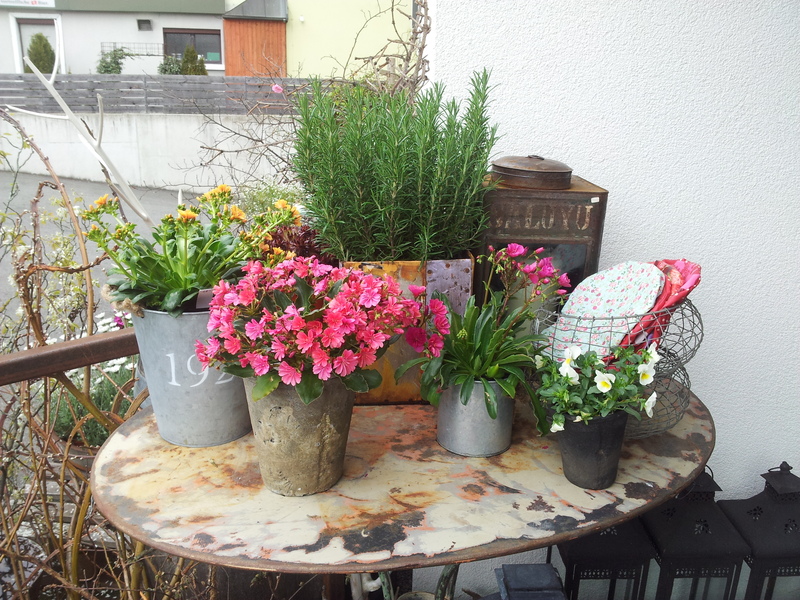 I hope to show you what I bought at querbeet -Flor and Glor soon, so stay tuned! Now, the sun is out and my garden is calling, so until next time, I wish you all a great Sunday! 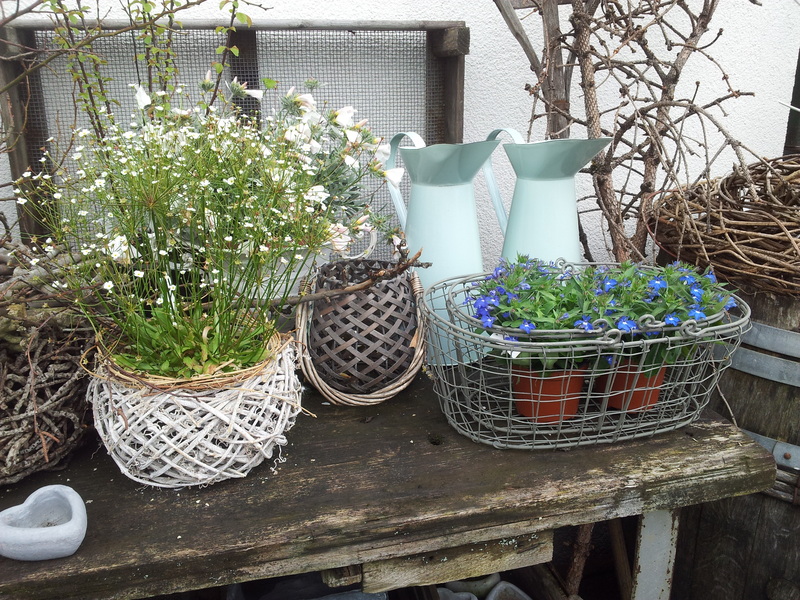 Gorgeous plants – you were so good to resist! yes have to get my garden cleaned up first!